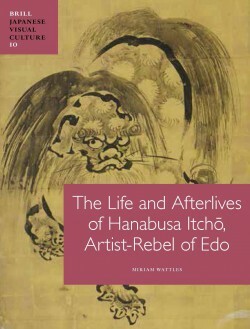 Miriam Wattles recounts the making of Hanabusa Itchō (1652-1724), painter, haikai-poet, singer-songwriter, and artist subversive, in The Life and Afterlives of Hanabusa Itchō, Artist-Rebel of Edo. Translating literary motifs visually to encapsulate the tensions of his time, many of Itchō’s original works became models emulated by ukiyo-e and other artists. A wide array of sources reveals a lifetime of multiple personas and positions that are the source of his multifarious artistic reincarnations. While, on the one hand, his legend as seditious exile appears in the fictional cross-media worlds of theater, novels, and prints, on the other hand, factual accounts of his complicated artistic life reveal an important figure within the first artists’ biographies of early modern Japan. Miriam Wattles, Ph.D. (Institute of Fine Arts, NYU, 2004), is Associate Professor of Japanese Visual Culture at UC Santa Barbara. She has published articles on Edo-period books, art, and historiography. Her present research is on the materiality and migration of books on toba-e, giga, and manga, 1720–1928.